He went to a party in Brighton on Thursday evening, he had gone by the time I got home from work but he had promised to pack before he went. I couldn’t see any sign of any packing having been done. At least he would have time on Friday once he got home before going off again to another party in the afternoon. But he would have to finish packing in the evening. Although I had taken the day off work I was out when he got home from Brighton, but he had gone again before I got in with the groceries. Still no sign that he had even begun to start packing. 56 arrived with her car fully fuelled for me to use. I drove her back across town to her house, where I clambered up onto her bed to change the light bulb that had blown a few days ago. I tried phoning Statto to offer him a lift home, but after several tries to get through I gave up. Eventually I received a text saying that he would walk…..shouldn’t be too late and not drinking so will be ok to finish packing. By midnight still no sign of him, several phone calls and a text all went unanswered. I really needed to get to bed but I wanted to speak to him about a few things before I went to bed. It was 1.30am when he arrived apologising for being so late. He says he is almost completely packed ……….I can’t see it myself. I have warned him that I intend to leave by 9am at the latest. He can sleep in the car if he wishes but I need him to be ready to go by 9 as I want to arrive in Sheffield by 2pm at the latest. Once we have found the house and unloaded the car I have a customer to visit before his shop shuts. We also need to find somewhere to buy some groceries for Statto who is going to be living up there for the next 12 months. I hope he gets on with his new housemates. I really don’t understand why I am like I am. Are there other people like me or am I just weird? There is an aspect of my life that I find very frustrating and inexplicable. I am very untidy, I don’t want to be untidy and yes I can usually find most things so long as nobody else has moved things. I hate being untidy and I am always thinking of ways to improve things. But nothing ever works. Yet as untidy as I am I cannot stand certain things. Are these just foibles that are mine alone or do others have the same obsessions. I rarely use butter/margarine or low fat spread but I do buy low fat spread for my family. When I do use it I have to scrape a thin layer from the tub in such away that the knife leaves the remaining spread smooth. All to often I find the tub full of gouges and uneven blobs of spread. How can I train my family to use the spread in the same manner that I do. My boys have a dreadful habit of leaving the kitchen cupboard doors open. I have to not only go around closing them but making sure that the double doors are closed flush to each other. At work there is a set of double doors that I have to pass through a number of times each day. Very often I notice that one of the doors is about 1cm open, I have to push it shut then go through the other door. Even if someone is holding the door open for me if it is the left hand door I still have to go through the right hand door. If I see a stack of books or other objects I have to sort it so that the stack is largest item at the base then graduating to smallest item on the top. Not only that but it has to be lined up so that if the items have a straight edge (ie books) the edges have to line up and must not overlap if at all possible. On my desk I like to have my ruler and pens lined up parallel, close together but not quite touching. So if I am so particular about these things among many others how is it that I am such an untidy person? Maybe I am just weird. My colleague was looking on the internet during his lunch break when he read about the Arab with so much money that he has had his name set into the desert sand. It is so big that it can be seen from space. Interestingly it isn’t in arabic letters and I thought it apt that in english it spells HA MAD. OK so thats just my sense of humour as it is …..Hamad. Anyway another colleague asked the question ……this man who is worth hundreds of Billion pounds. Would you sleep with him for £1billion? Interestingly she said yes even though she is happily married because you could do so much for all your family etc with that kind of money. My colleague who had originally brought the subject up said that hell yes he would even sleep with the guy for that kind of money. But I said no not for any money just for the money. I would only sleep with him if I liked him. No amount of money would make me sleep with someone I didn’t like. So for me his personality is more important than his money. Out of the three of us I am the one most in need of a cash injection. Would you have said yes or no….if the answer is yes how much would it take for you to say yes. If your answer is no, what is your reason? I am sitting here on a Saturday evening mid July looking out of my window at blue sky and sunshine. All I can think is that I must have been wicked in a former life. I know I have not always been good in this life but did I really deserve that? It was a few weeks ago that I made up my mind, a plan was forming in amongst the clutter that is constantly trying to form itself into some kind of sense within my skull. My boys are growing up fast. Whilst I will remain central to their lives for a while yet I am not as all important to them as I once was. Even my youngest has become an independent little soul (ok so maybe he is way taller than me but he will always be my baby). I have a new asset in my life ……….freedom!! It is time to get myself sorted so that I can take full advantage of this freedom. Eventually I might even allow a man to join me in my adventure they call life. (But he will have to be very special). I have decided that I am going to live this life whilst it is mine to live. I was diagnosed diabetic 2 years ago but now that it is under control with medication I am going to be sensible about what I eat but I will not completely cut out all the nice things that are not so good for me. I shall try to get fitter but I will sometimes eat things that are bad for me. The way I see it is that if I cut out all the things I enjoy I would be betraying myself. Just eating things that are good for me and saying no to all the nice things when I am at a function etc is not a way of living that is a way of existing. I did not fight to survive cancer to just exist. I consider my battle with cancer as my wake up call to actually live instead of letting life pass me by. So the occasional cream cake or delicious desert will remain part of my diet. But I will compensate for this by getting myself fitter which in turn will allow me to enjoy a better life. Last month an idea came to me, I was figuring out how I can get myself a more active social life. I need to join a club of some kind, but it will have to be something that will not only bring me into contact with other people but not cost me too much. I am not and never was very sporty. My co-ordination skills are not great. I gave up running when I was 15 for medical reasons. Thinking hard (well considering it was a weekend and I don’t do thinking on my days off from work) I surfed the net for what I was looking for. I found the local club, based in the nearby city, saw that they have a few events coming up on Saturday mornings that are suitable for beginners. In truth I am not a complete beginner but after 30 years and advances in technology I might as well be a beginner. I emailed the club and arranged to go to their next event a week later. How did I forget that my boss had already roped me in for our annual bootsale to raise funds for our christmas dinner. So much to my disappointment I couldn’t go but never mind there would be another event in two weeks (today). I had been watching the weather predictions for the weekend during the week with growing dread. This morning I got up early had my breakfast and had the internal debate do I go or do I stay ………..it is after all raining! yes but it isn’t raining hard just steady drizzle. Do I really want to get wet? If I do go I might make myself ill (my glands were up yesterday but ok today). But if I don’t go it might be ages before I get the chance again. If I don’t go today will I be able to bring myself to go next time ? What excuse will I find next time? So I picked up a towel a sandwich and bottle of diet coke, my purse and my keys (not forgetting my sandals to change into afterwards). Was it my imagination or was the rain getting heavier? OMG the motorway was horrendous (not sure if it was rain or just spray or both) visibility very bad and yes some idiots still had no lights on ……where do they keep their brains or were they on a suicide mission? I studied my map book to find where I was going…..I had never been to that part of the city before. Eventually I arrived at the private school where the event was being held. It was almost 11.30 the website had said registration was between 10 and 12. By the time I had walked around the corner to find the registration table given my name and age told them I only wanted to do the beginners course. Had a brief conversation with the club official who explained how the new digital checkers work I set off through the gardens. Were those dogs I spotted between the hedges, no I think I was a couple of deer. Clutching my map I made my way from one checkpoint to the next until I completed the course. It might be 30 years since I had to give up this sport but it felt like I had never stopped, I even managed to jog around some of it (when there was nobody near enough to see). I arrived at the finish soaked right through, slightly out of breath and red in the face, my ankles ached but all in all I enjoyed myself. I will be back. I will join the club, I will not only get fitter than I am now but it will also give me a bit more of a social life. So for me orienteering is going to be a part of my future………I just wonder why it had to rain all morning and now we have blue sky!! It has been a rather exhausting week for me so no time or energy for blogging. But there has also been a rather momentous event in the life of my family. An event that has been building up for the last two years. It has always been on the cards that I would be attending the evening in question. About 2 months ago my two youngest sons were requested to be a part of the evening. The other two both being away at University. Then about 3 weeks ago it became apparent that Statto would be home from Uni. We couldn’t leave him out, table plans were altered to make room for him. The biggest question in my mind was how on my very limited budget would I get all three lads suitably dressed for the occasion. Statto and Pug have both had suits to wear for their school proms a few years ago. But Statto has lost a lot of weight in the last 6 months and had to buy new clothes several sizes smaller. His suit would fit none of them. Skater has been on work experience this week in a clothes shop maybe he could find something there. Because the teachers were on strike on Thursday the college Pug attends was shut for the day, it was also my payday. I transferred money into Skater’s bank account and arranged for Statto and Pug to meet Skater at lunch time. But as luck would have it I was poking around in Skater’s wardrobe on Wednesday evening and found a suit bag hanging up. I asked what was wrong with the suit inside, it was an Italian suit from M & S still with labels intact. (my ex works there) Not one of them knew it was there or even noticed it!! It was a perfect fit for Skater but it was also a perfect fit for Statto. Eventually it was agreed that Statto would wear it. I later found a pair of black trousers and jacket that were just slightly big for Skater, with a belt these would be fine. So in the end it was just new shoes for both Skater and Statto that were needed. By the time I had picked Skater up on my way home from work Statto and Pug were already dressed waiting for their Grannie to collect them. This meant that Skater and I could get ready without them getting in our way. 30 minutes later we were also on our way to the local golf club. Where we joined the rest of the family at our table (the top table no less). 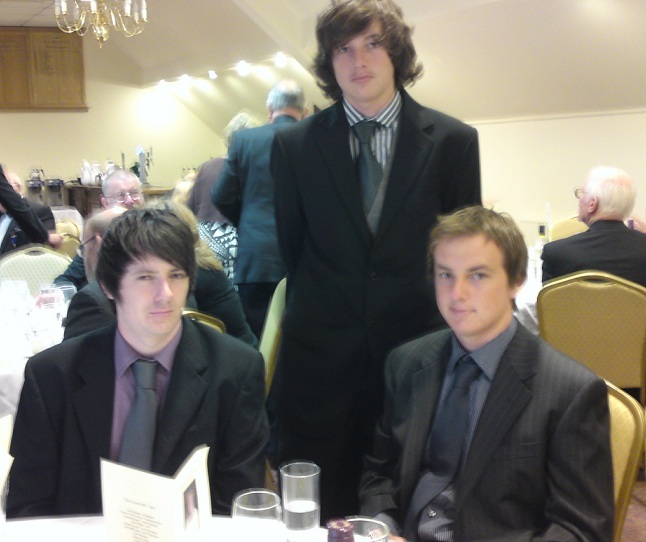 This was the first formal dinner any of my boys had attended (I don’t include school proms as I doubt there was much decorum) All three lads managed to have sensible conversations with the people the were sat beside. For this particular evening I was an extremely proud mother and daughter. Proud of my handsome sons (my one regret being that Prodigal was not there also) and proud of my mother as she was installed as the new President of our local Rotary club.